I was blocked by some health issues and then catching back up with real-life work. But now I finally have some time at hand. unfortunately the deadline for the contest (April 8th) is now approaching fast. Since my last update I did a first test with the hand and staff. But I started with the rider's turban. 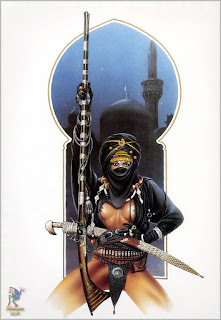 Some of you older ones my know Chris Achilleos' "Harem Guard"
Which is an illustration I always loved. So I will try to build my rider in her spirit. Then I started with her boots and the "skirt"
While her skirt broke off (it was a mix of SuperSculpey and Greenstuff) I finished the boots, made a new staff and began to sculpt her hand. I hope to have some more images soon.